A moment is an event that lasts all of a second while the memory remains embedded in our mind for a lifetime. A photograph records the event while a painting develops into a layering of memory and emotion that becomes a lasting heirloom. Through art and photography a single moment reaches eternity and ordinary lives become extraordinary fine art. When Is A Photograph NOT A Photograph? a rendering, an imitation or interpretation of its subject..."
If a photograph is not a rendering why, then, are all old photographs covered with pencil and paint and, more importantly, when is an old photograph not a photograph? Let us begin this discussion by first determining an important way to tell an old photograph from a drawing. Look closely at our two examples above. Each one comes from the early nineteen-twenties, yet, one is an art enhanced original photograph and the other is a drawing from start to finish. Which one is which? The portrait artisans of earlier times were extremely talented! Artists had been responsible for capturing the human likeness as far back as recorded time and their skills were honed until their subjects appeared lifelike and often photographic. Before the invention and affordability of photography to the general public, one depended upon the artist to forever preserve a person's likeness in paint, charcoal and pencil. Answer to the question: the image on the top is an original photograph whereas the one on the bottom is a charcoal drawing. Here is what to look for to know the difference. During the last half of the twentieth century, most people were familiar with photographs that, when enlarged beyond their negative's capabilities, disintegrated into small dots. 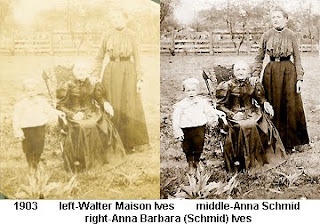 Today, using computers, we know photographs are now composed of squares called digital pixels. However, photographs from the late eighteen hundreds and early nineteen hundreds showed different markings. When they were enlarged, their images broke apart into small "s" shaped squiggles. These lighter coloured markings could mostly be seen in the dark shadows of the cheeks, eyes, nose, neck and possibly dark clothing. Our woman on the top clearly shows these distinct markings of an original photograph. The charcoal drawing, beneath, has smooth, blended darks, a sure sign of a work of art. There is no mottling or other spotting in the shadows. Another detail in our photograph is that the photograph is "silvering". The right side of the hair detail shows a silvery blue haze. The silver in the surface emulsion is oxidizing and reflecting and the focus of the hair is soft. 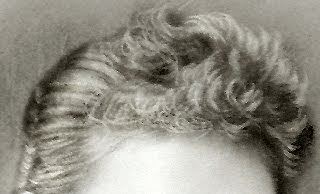 The left side of the hair is covered with brown paint and distinctly drawn strokes of painted hair can easily be seen. As further evidence of a work of art, a classic drawing technique is used on our charcoal portrait. The entire head of hair is covered in dark charcoal and an eraser was used to bring out the highlights and individual hairs. What an outstanding technique to create lifelike hair. Most photographs could not be enlarged to fill a wall sized enlargement. Rather than leave a hard square around a person's picture, photographic artisans painted darkened vignettes around the outside edges of the paper using a crude, but effective, airbrush called an atomizer. 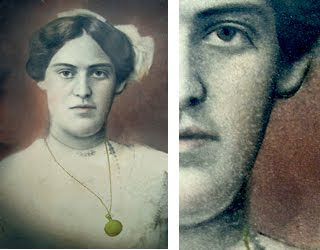 Watercolour paint was sprayed on photographic edges to make them dark and hide the square edges of the negative where the artist chose to leave the outside edges of the portrait the lighter colour of the paper on which he drew. Paint and drawing materials were often added to photographs to complete clothing, hair, variations in backgrounds and faded details. Colour was often added to backgrounds, cheeks and lips as we see here in our enhanced lady. It was not only common, but absolutely necessary, to enhance most old photographs to bring out their details, add colour (especially to jewelry) and enhance them to look their best. Many of the early photographs I see brought to the Studio have been damaged by people who unknowingly try to clean these images using a cloth and water. Intentions are good, but as this artwork is usually water based paint and drawing materials cleaning any photograph should best be left to experts. I would like to point out a final aspect about the charcoal drawing. Notice that there appears to be a second shoulder drawn out of the woman's chin line. This is the exact position that a shoulder line would naturally appear in a three quarter posed subject. However, this woman is rather heavy set and by placing her shoulder line higher up into her head she would look, for lack of a better term, fat. By dropping her shoulders down and elongating her neck the artist has taken ten to twenty pounds off the woman and used an artistic trait of flattery. As a portrait artist I have used this form of flattery several times and thank the artist for his sensitivity. I certainly appreciate it as this woman is my Great Grandmother and my Father's side of the family is heavy set. Both my daughter and I get our genetics directly from this female line. As to why the artist didn't erase, or better hide, his artistic change, I cannot say. I am only thankful that upon close inspection of the work his name, studio and Toronto, Canada address can be found hand signed in the lower right hand corner of the work. This, and the matching portrait of her husband, were commissioned and drawn on the couple's honeymoon. They were drawn directly from the original wedding photographs taken of their marriage union. I have both original photographs and original charcoal drawings. Side by side they are astonishingly alike. Are images original photographs with art enhancements or are they artistic masterpieces? Look for the signs and you will now be able to tell a photograph from a superbly executed rendering. "A photograph is usually looked at----Seldom looked into." One of my regular customers always brings in the most interesting photographic images for duplication and restoration. Images from the Civil War, college graduations from the 1930's and even ancestral trips to the far East. One never knows what this man might bring in on any given day. The image above arrived at the Heirloom Art Studio as a tiny record of a Great Grandfather's hunting camp. No more than three inches across and faded almost to single values of beige and gray, the photograph needed to be copied and restored to bring back the contrast and detail and enlarged greatly in order to adequately view the people, place and things within the scene. Accomplishing this task is what I do best and would be no particular problem to present my customer with an excellent image he could study and display for future generations. Before I began my work, however, the client asked if I could help identify the age of the photograph. The paper and silvered emulsion surface of the original photograph was of little help since this particular paper process covered far too many years to isolate this image to a specific decade. Dating photographs by the contents is the next clue. Woman's clothing is easier to identify than men's wear because styles and hem lengths, throughout time, tended to change approximately every ten years. However, we have no woman in this photograph. As these gentlemen are not in formal wear where jacket lapels and tie widths would give immediate clues to age, little could be deduced looking at the original photograph because of its size and condition. I would have to head for the camera and darkroom to begin the restoration process and see what an enlargement of the image might bring to view for more clues to date the photograph. What the client really needed to know was whether the photograph had captured his ancester before or after a particular event in his life. Was the photograph from 1875, before the event, or taken around 1880? Well, we shall head for the darkroom and see what develops. Sorry, I couldn't resist saying that! Enlarging the photograph and viewing details up close brought forth many discoveries. Very obvious was the dark skinned family servant who was taken along on the hunting trip to prepare meals (and one can only assume beds, boots and whatever else servants were expected to take charge of). At least it seemed the hunting party took part in pulling feathers from the wild game recently shot or did they merely pose with these birds to make the scene look good? Tiny signals ranged the photograph but not within the narrow span needed to determine the date my customer was hoping to place the event. THEN.....I spotted the one detail that might lead to a difinitive answer. Look closely inside the open flaps of the tent. What do you see? These hunters took the time to pack all the essentials. All the modern conveniences were brought on this trip including.......the rolled toilet paper. AHA!! This could be a great clue. Any good recorder of trivial facts knows that bathroom essentials have been around, in one form or another, since ancient times. An expert on trivia might know that Joseph C. Gayetty, of New York, started producing the first packaged toilet paper in the U.S. in 1857. It consisted of pre-moistened flat sheets medicated with aloe and was named "Gayetty’s Medicated Paper". Gayetty's name was printed on every sheet. After a quick information search it is learned that rolled and perforated toilet paper, as we are familiar with today, was invented in the late 1870's. Various sources attribute it to the Albany Perforated Wrapping (A.P.W.) Paper Company in 1877, and to the Scott Paper Company in 1879. The customer needed to date this photograph of his ancestor either in 1875 or 1880. It had to be taken either before or after certain family events, but which time period. 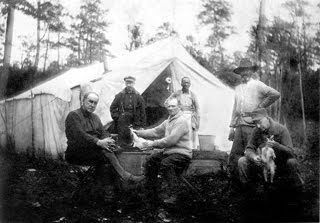 For our gentlemen hunters to have modern rolled toilet paper in their encampment means this photograph could not have been taken in 1875. If this hunting trip took place after a recorded family event, the existence of toilet paper in the image absolutely dates it to 1880. Imagine! Toilet paper is the single clue that gives us an exact window to narrow down the date of our unique photograph. It just goes to show that you never know what you'll find in a photograph if you don't look into it. On a side note, since trivia has become secondary to today's story, the Scott Paper Company was too embarrassed to put their name on their product. As the concept of toilet paper was a sensitive subject at the time, unlike Gayetty who placed his name on every paper sheet, the Scott Company customized their rolled paper for each of their specific customers. As such, the famous Waldorf Hotel became a "big name" in toilet paper. “All photographs are there to remind us of what we forget." Anyone familiar with my fine art paintings knows of the storytelling portraits I create called "Spirit Paintings". I bring up this particular work of art because little did I know at the time of laying out the composition for this painting that an historical revelation would take place. All my years of restoring and duplicating photographs, all my years of training to know photographic processes and memorize production dates, to know the ins and outs of photographic details had not prepared me for what I was about to learn next about the history of photography. Upon completing my painting, "Oh, To Be Sailing", I emailed my friend Henrietta photographs of both the final painting and the individual photographs that were the subjects of the painting. I've spoken about Henri before as my genealogical partner but not mentioned that Henri's career expertise is as a highly trained Nurse and Administrator. It is not uncommon for me to direct the odd medical query to my friend, but I have now learned that her expertise in the medical field has opened a new aspect of photographic research and data for both myself and my clients. The family album has become a visual record of one's family medical history!! Upon receiving the emailed photographs of my newest painting and ancestors Henri immediately emailed me back and asked the following question, "What do you know about your Great Grandmother's medical history?" The only answer I could give at the time was that she had been diagnosed with breast cancer, had a breast removed at Harper Hospital in Detroit, Michigan and died one month from the day of the operation on May 20, 1923 at the age of 48. 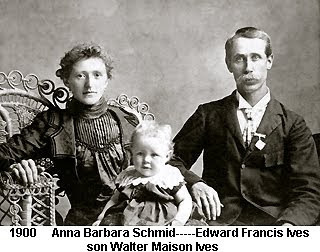 Through letters, autographs, photographs, data, and historical accounts I knew everything about Anna Barbara's birth in Switzerland, her arrival in Canada, her love for the stern, but handsome, ship Captain Frank, but knew only her cause of death and nothing else about the medical history of this lovely woman who was long since gone. All my years of research and I had never thought to ask medical questions about my family. Henri referred to one of the research photographs and proceeded to direct my attention to the hand and fingers of my beloved ancestor. She asked if I noticed the triangular and enlarged shape of her knuckles and the misshapen form of her fingers. Having just completed my painting, I admitted that this malformation had immediately struck me as inconsistent with my life drawing training, but as I was painting a vision of my ancestors and not a photographic depiction I had merely questioned the odd anatomy and pushed the thought to the back of my mind. Henri continued to explain that this misshapen hand showed distinct symptoms and traits of Rheumatoid Arthritis. "This woman," Henri stated emphatically "must have experienced a great deal of daily pain." Good grief! There was a long pause at which time I realized it was time to breath. I had so many photographs of my Great Grandmother, so many hand written notes including a love note to her husband shortly after they met and all of her cook books (she was the housekeeper and cook of a private club on Pelee Island in Lake Erie) that I had grown up feeling as if I had known Anna Barbara in real time. Her breast cancer pained me, but learning of her own daily pain with this crippling disease broke my heart. 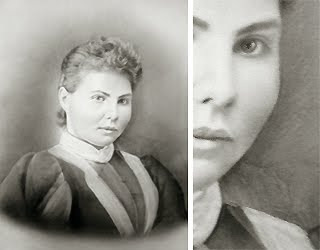 Anna Barbara was only twenty-six in the photograph I had used for the subject of my painting. How terrible to learn how painful her daily routine must have been even at that young age. Henri and I discussed the aspects and importance of physical symptoms appearing in the photographs of the family album and what this would mean to my customers when added to my other expertise in dating and identifying historical photographs. I thanked her for this insight and set out on a mission to contact my immediate family with this information. Phone calls and emails went out to close and distant family relations to inquire about the medical aspects of what I had just been given as well as any other pertinent information I could gather. Yes, my eighty-six year old father did remember that his paternal Grandmother's side of the family did suffer from extreme arthritis. My ninety-seven year old Great Aunt is alive and well and as sharp of mind than most of those half her age. She has always been just Aunt Frances to me and as an active part of my life rarely brings to mind the fact that she is actually one generation removed from me and the daughter of our Great Grandmother in question. It stood to reason that although Aunt Frances was only ten years old at the time of her mother's death surely she would remember her physical condition. I planned a visit home to Canada to meet with her to ask questions and study photographs. In the meantime, I headed into the photographic darkroom with a collection of photographs and eighty year old negatives that I had, until this time, not yet restored or had time to print. There is time to do customer work, but never enough hours in a day to follow the personal pursuits of my own. A badly faded photograph subjected to ultraviolet light and special darkroom techniques brought back the intense image of my Grandfather, Great Grandmother and Great Great Grandmother. Look at the hands on Anna Schmid shown above. Regally sits the mother of my painting's subject with crippled hands and the distinct enlarged knuckles Henri had just pointed out as important to my genetic history. My visit with Aunt Frances not only confirmed everything that was appearing before me, but she additionally informed me that Anna Barbara's older sister was badly crippled by arthritis. Her feet were contorted inward so badly they hung diagonally making it difficult for her to walk. It seems, as a young teenager, my Grandfather (the child in the photograph above and Aunt Frances' older brother) took sections of old tires and layered them diagonally to the bottoms of Aunt Lena's shoes so that although her feet were diagonal, the soles of her shoes walked the ground flat making it possible for her to live a full and long life well into old age. My father has arthritis in his shoulders, but as it is not Rheumatoid Arthritis, says it is just a little hindrance to enjoying another day at his age. As an artist I am aware of every ache and pain that arises in my body, but greatly relieved to have it confirmed that most of my ailments are from spending so many hours at the easel or drawing on the computer tablet without taking the necessary breaks my physician warns are necessary. My genetic family history has been noted but, given the pain and agony I have since learned comes with RA, I arise thankful each morning that an ordinary aspirin will conquer any aches and pains that currently plague my body. As an additional thought on this subject I would like to add one last example to stress the importance of searching your family photographs. While printing that batch of negatives I mentioned I was astonished to find forgotten images of people attending a family wedding. I recognized only half of the faces peering out at me and who was the jovial looking man in the wheelchair with.....only one leg? After conferring with my father, I learned that this well dressed figure was none other than Uncle Alphonso Allan or "Uncle Tuggy" as I had grown up to know him. He passed away just before I was born and I had only seen photographs of him as a young man. This one-legged gentleman was an ancestor? It was no secret that diabetes ran rampant in my mother's family, but imagine my utter shock when I learned it was there, in my father's side of the family in photographic record before my eyes. Uncle Tuggy suffered so badly with poor circulation, swelling and painful leg disorders as a result of his diabetes that he (and I quote!) told the Doctors to, "Take the damn leg off". Yikes! No one bothered to tell me this WHY??? So, there you have it. The old adage rings true one again, YOU DON'T KNOW IF YOU DON'T ASK. More importantly, you might SEE if you take a look. Good or bad, you never know what medical history you might see when you get out the family photo album.